Modern and comfortable, these funky designed vans capture the style and imagination of free spirited travellers. Special design features not found elsewhere, mini kitchens include crockery, cutlery, full set cook wear, CD sound system and modern cosy interior with dining table. All this plus an awning (available for hire) gives you a fully enclosed extension to your sleepervan. With these sleepervans you are guaranteed to stand out from the crowd along the main routes or off the beaten track. 1999+ Toyota Liteace/Noah. The Hi Top Tui Trail Finder is one of our most popular vehicles: creative design and clever use of space means 2-3 people can travel and live in comfort economically. 2008-2010 Models. This vehicle has been certified self contained. Can freedom camp in designated areas. One child seat can be fitted rear/forward facing in the middle seat - this is a tight fit. 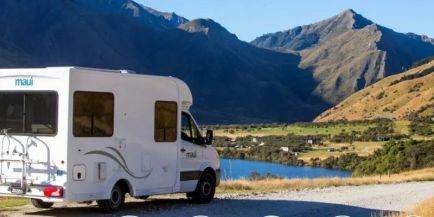 The Trail Explorer Motorhome boasts all the comforts of home yet is easy to drive and handles great on New Zealand's touring routes so you can enjoy the ultimate superior road trip. Enjoy luxurious features such as DVD player, air-conditioning, fully equipped kitchen, plus full shower and toilet facilities. Every drawer and cupboard reveals a surprise - fridge, stove, wardrobe, crockery, cutlery, linen, towels and much more! With on-board shower and toilet, the Trail Explorer is certified as ‘self-contained’. Ford Transit 2011 Model. Two baby seats (three years and under) can be fitted to the rear forward facing seat with an anchor bolt. OR four booster seats (minimum four years of age) can be fitted to the rear dinette seat with a lap-sash belt. This vehicle is all about luxury on 4 wheels, designed with all the features of a full sized motorhome for maximum living in an easily navigable space. It offers practical, easy living with multiple access options for great indoor/outdoor flow. It’s the perfect adventurer’s vehicle – imagine coming home after a busy day of activities to the aroma of freshly brewed coffee and surrounded by all the comforts on the road. The luxurious interior has a cosy design to enjoy everything at your fingertips with ample space to stretch and relax on your king size bed. 2011-2014 Ford TransitThe Tui Trail Seeker has been certified as self contained. Permitted to freedom camp in designated areas. If you are interested in off the beaten track outback adventure, flying fishing, trekking, 4WD adventures, camping off the beaten track and for a taste of true pioneering sprint, drive and navigate yourself in a Tui Bush Camper 2 Berth 4-Wheel Drive. The Tui 2 berth Bush Camper is a 4WD unique camper and perfect for off-road family adventures. The extra fuel capacity means you can travel for longer without having to stop and the indoor and outdoor cooking facilities allows you to enjoy a dinner under the stars or in cosy Tui Bush Camper. Special Features; Extra fuel capacity, Indoor/outdoor cooking, Rear air conditioning, Awning Pop top roof for extra space and ventilation. 2009 Toyota Hilux. Vehicle is not certified self-contained. Freedom Camping not permitted in this vehicle.